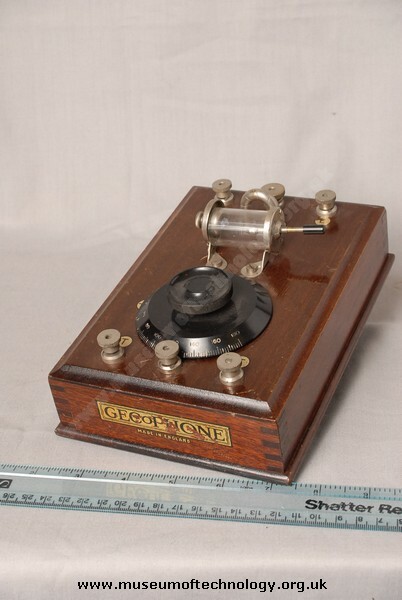 This is the GECOPHONE Junior Crystal Set BC1700. Built by GEC (UK) in 1925, this simple crystal set is in a polished mahogany case. The connection points for the aerial, earth and headphones are all provided, the controls comprise a tuning knob and a lever to adjust the detector. This set would have cost 15s 0d in 1925,the 1600m Loading Coil would cost an extra 7s 6d. At the back of the set is the 'Entirely British Manufacture' BBC stamp.